Gareth Bale was man of the match once again for Tottenham Hotspur on Monday night, as he scored a late winner from 25 yards to earn his team three valuable points at Upton Park against West Ham United. The game had appeared to be slipping away from Andre Villas-Boas’ men – Bale had given them an early lead with a well placed left foot shot, but a penalty from Andy Carroll – after the striker had been fouled by Scott Parker – and a clinical finish from Joe Cole, following some poor positioning from the Spurs defence, had given West Ham a 2-1 lead. Despite immense pressure, Tottenham could not find a way past Jussi Jaaskelainen, as the Finnish goalkeeper made a string of fantastic saves to deny Bale, Emmanuel Adebayor and – on three separate occasions – Steven Caulker. Nevertheless, Spurs were not to be denied a win that moved them above Chelsea into third in the table and they got exactly that thanks to a scrambled effort by Gylfi Sigurdsson, followed by Bale’s second goal of the game to secure the victory, which was the Welshman’s 13th in his last 13 matches in all competitions, 15th in the league of the season…I could go on, but I have already written enough superlatives about him this week. To say that Tottenham are a one man team is wildly inaccurate; but without Bale – especially considering that we have no in-form strikers in our squad – Spurs would not be in pole position to secure one of the two remaining Champions League berths (after the two Manchester clubs). It is not realistic to expect him to be the club’s saviour every week, but Tottenham are hardly one-dimensional and in particular, the threat of Aaron Lennon’s pace on the right-wing means that opponents cannot focus solely on Bale. What is astounding is that everybody knows that the Welshman will attempt to get the ball onto his left foot, which should make him easier to defend against, yet time and again he finds time and space to unleash a strike from that side. Spurs fans everywhere will be hoping that this purple patch, during which Bale has been almost unstoppable, lasts for at least one more week, as they will need him on top form for this Sunday’s huge derby clash against Arsenal. The Gunners head into the fixture on their North London rival’s turf behind them by four points, but they will still have confidence that they can overhaul that gap, given that they have not finished below Tottenham in the league since 1994/5. Last weekend, they stayed within touching distance of both Spurs and Chelsea (who are two points above Arsenal in fourth) with a 2-1 win at home to Aston Villa thanks to two goals by Santi Cazorla, the second of which came inside the final five minutes to give Wenger’s men the victory. In all likelihood, Arsenal need just a point on Sunday to be considered favourites to take third spot: after the derby, their final ten Premiership games include no away trips to anyone in the current top six (they go to Swansea, West Brom, Fulham, QPR and Newcastle); while their home matches, outside of Manchester United, all look winnable (Reading, Norwich, Everton and Wigan). By contrast, Tottenham must still travel to Chelsea, Liverpool and Stoke, as well as Wigan and Swansea; and their home matches include a fixture against Manchester City. If Spurs are going to have a realistic chance of finally finishing above their rivals in the Arsene Wenger era, they must go all out for a win on Sunday to give themselves a seven point cushion. However, if they defend as poorly as they did on Monday night, when time and again West Ham were allowed to get behind the defensive line, then the Gunners will have a field day and could match the five goal tallies they have racked up the last two times the clubs have met. Of course, if Arsenal prove to be as adept at stopping Bale as West Ham, Lyon, Newcastle et al, then there could be a repeat of 2004‘s 4-5 result, which some call a Premiership classic, but I remember – speaking from the perspective of a Spurs fan who was in the Paxton Road stand – as one of the worst matches I ever witnessed in person. There is still the possibility that the two North London clubs, as they did last season, could both end up in the top four, this time that would result in them both qualifying for the Champions League, as nobody who would finish below them in that scenario is left in this year’s competition. That is not good enough for Tottenham – they must be aiming to finally finish above their bitter rivals, having not done so in such a long time that when they last did: President Clinton was in his first term of office; John Major was the British Prime Minister; Oasis were still three months away from releasing Morning Glory; I was not yet 14 years old; and Arsene Wenger was not appointed until 17 months later. This has become the most one-sided rivalry in sport, since the Boston Red Sox won the World Series in 2004 and ended 86 years of inferiority to the New York Yankees – being second best in North London has to end for Spurs and the beginning of that must come with a victory over Arsenal this Sunday. The date of the game, March 3rd, has a significance for Villas Boas, as it will mark a year since his last match in charge of another London team, Chelsea, who lost to West Bromwich Albion on that day in 2012, leading to his dismissal. The Blues second manager since then, Rafa Benitez, made headlines this week for comments he made following his team’s 2-0 victory away at Middlesbrough in the FA Cup Fifth Round on Wednesday. In what was described in most media outlets as a rant – but in fact, as the video shows, was him speaking calmly and reasonably – Benitez gave his perspective on the constant criticism he has faced from a section of the club’s fans and the error he believes the board made in defining him as an “interim” manager* for his tenure in charge at Stamford Bridge. While the Spaniard was entitled to offer his point of view to the situation, the opposition of many Chelsea supporters to his appointment was understandable: Roberto DiMatteo had played for the Blues and then led them to Champions League and FA Cup wins and, while his league form had not been the best – remember, they did finish sixth last season and AVB had departed when they were a place higher – many believed he deserved time given all the success he had brought the previous May; plus there was animosity with Rafa during the Mourinho era, when the two sides had met in Europe’s top club competition. 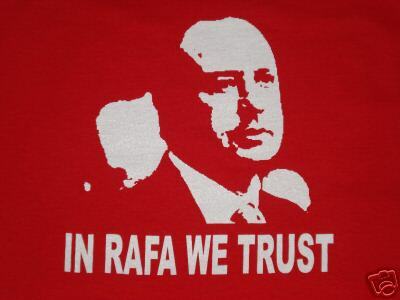 Because of this, Rafa may not have gained backing from some factions even if he had won every single match he took charge of, but he has in fact only seen his side victorious in half of their fixtures under his stewardship. Both DiMatteo and Villas-Boas lost their jobs following matches against West Brom – Benitez will need no reminder over who Chelsea’s opponents are at the Bridge this Saturday. *Which is a tautology at Chelsea nowadays anyway – since Roman Abramovich bought the club in 2003, there have been 9 different managers: Claudio Ranieri; Jose Mourinho; Avram Grant; Luis Felipe Scolari; Guus Hiddink; Carlo Ancelotti; Andre Villas-Boas and now Rafa Benitez. When the 10th coach is appointed in the summer, it will bring the average to 1 per year – nobody can consider it a long-term appointment. In the Premiership last Sunday, Chelsea were beaten 2-0 away by Manchester City, with the champions keeping the gap between themselves and United at 12 points, as Sir Alex Ferguson’s men had won by the same scoreline at Loftus Road against Queens Park Rangers the day before. That defeat leaves QPR six points adrift at the bottom of the table and, if they are to escape relegation, they will have to start winning immediately. Between now and the end of April, five of their eight fixtures are against the teams immediately above them in the table – but the fact remains that they have not beaten anybody in the Premiership since their 1-0 victory at Stamford Bridge on January 2nd and survival looks highly unlikely. Elsewhere last weekend; Fulham’s Dimitar Berbatov and Newcastle’s Papiss Cisse both struck fantastic volleys to help their teams to a 1-0 win over Stoke and 4-2 success against Southampton respectively; Romelu Lukaku scored twice to help West Brom beat Sunderland 2-1; Reading lost 3-0 at home to fellow strugglers Wigan; and two goals in the final four minutes saw Norwich turn their match with Everton around and they secured their first Premiership win in 10 games. This weekend, alongside the North London derby and Chelsea vs West Brom – for which the visitors will not have Lukaku available as he cannot play against his parent club; Manchester United entertain Norwich; Reading travel to Everton; Fulham have an away match with Sunderland; and Wigan and Liverpool meet at the DW Stadium. Swansea will have the League Cup – their first major trophy, which they won by beating Bradford 5-0 at Wembley last Sunday – to parade before their home fixture with Newcastle; Harry Redknapp takes QPR to face one of his old clubs, Southampton at St. Mary’s, with the match being played on both of the opposing managers birthdays (though Mauricio Pochettino is 25 years younger); Stoke host West Ham; and, on Monday night, Manchester City are in Birmingham to play Aston Villa. Tottenham vs Arsenal – Home win – Come on you Spurs!